An important stucco and frescoes decoration qualifies the first floor of the Castello del Valentino, noble residential floor and representation floor for the court. The “Salone d’Onore” (Hall of Honour) is at the center of a composition of two symmetrical apartments, originally intended for Cristina di Francia and young Carlo Emanuele. A series of sketches of interiors represents a precious pictorial evidence of the original decoration of the rooms on the noble residential floor. 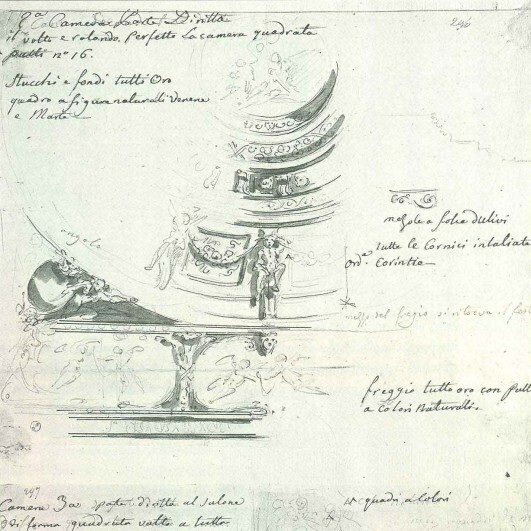 The sketches are stored in an album at the “Biblioteca Reale di Torino“ (Royal Library of Turin) and are sometimes annotated in the margins with observations by Leonardo Marini, «disegnatore ordinario delle camere del Re» (ordinary King’s rooms designer) since 1782. Disegno della decorazione della Stanza delle Rose, fine del XVIII secolo. Torino, Biblioteca Reale. 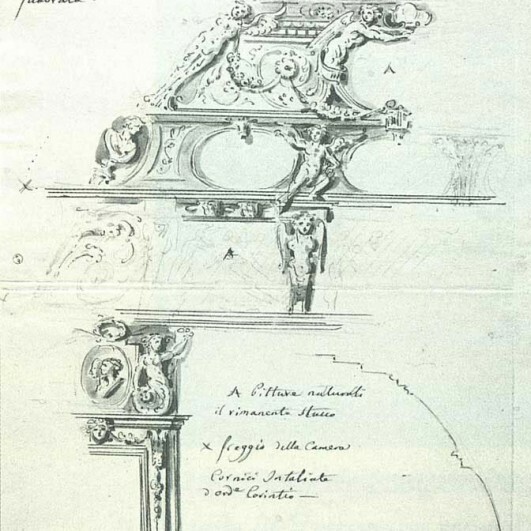 Disegno della decorazione della Stanza del Negozio, fine del XVIII secolo. Torino, Biblioteca Reale.